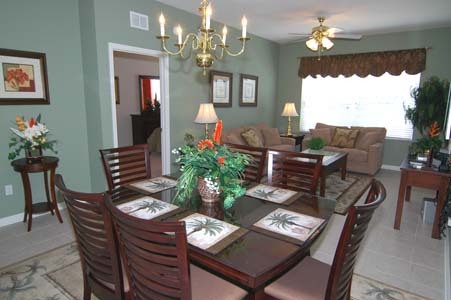 Not only will you find great savings, but you will be vacationing in luxury at our Windsor Hills Resort Condominium! 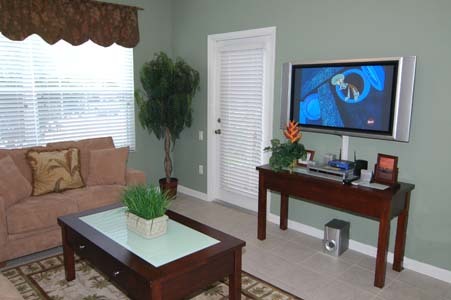 Located less than 2 miles from Disney World, this 3bdrm/2bath luxury unit is decorated with a warm Florida Palm Tree Atmosphere. 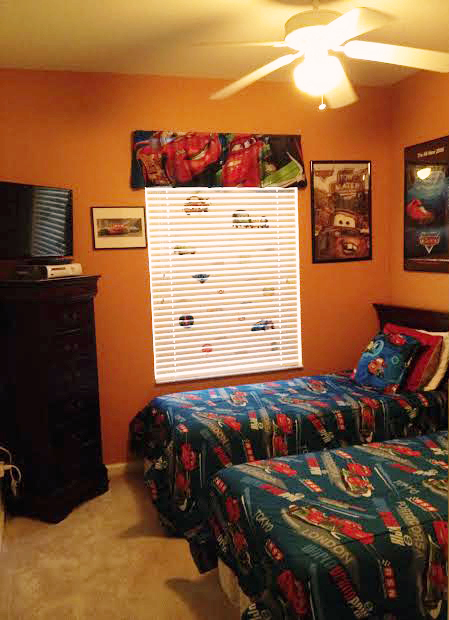 With King size beds in two bedrooms, the third is with 2 twin beds decorated after the character Lightning McQueen from the Disney movie "Cars". There is even a queen size sleeper sofa in the living room. Bring your laptop or tablet and use the wireless high speed internet or just relax in front of the big-screen television or the 32-inch LED televisions with DVD players located in each bedroom. With all of the amenities of a 5 star resort, you will experience a magical vacation that you and your family will remember for years to come. You and the kids will truly enjoy this luxurious condo and resort. The resort has a resort style pool with a water slide, dancing fountains and a hot tub. The clubhouse also has a professional fitness room. There are also tennis courts, volleyball courts, basketball courts a putting green, sundry shop and guest service office all on the property. Numerous children's playgrounds are also located throughout the resort. WHY RENT FROM US? Price and Quality! Good value for your money! We want your business from your 1st stay with us to the many more to come in the future. We want your vacation to be special, so contact us to make it special. Our condominium is your home away from home. Here are just a few of the unit's features:2 of the bedrooms have King size beds,1 of the bedrooms has a set of Twin beds,1 Queen Sleeper sofa in living room,2 Full size bathrooms,free wireless high speed internet service,big screen TV and DVD in living room , 32 inch LED TV/DVDs in every bedroom, X-Box 360 gaming system,Pack-n-Play Crib,highchair, strollers, fully equipped kitchen with all appliances (stove, microwave, dishwasher),full size washer and dryer, free telephone to US, Canada and Puerto Rico, cable service,patio area with table and chairs,central air conditioning and heat, all linens and towels provided,iron and ironing board provided,property is professionally managed with 24/7 maintenance.With all these features, you are sure to have a wonderful vacation. Our booking process is easy. We provide you with a simple one page contract so you know exactly what you are getting. Pay Pal is used for your convenience. We send you the invoices via email. You have everything in hand before you leave home so your trip is worry-free.